Tonys Photos: WIN a camera, SAVE 40% and grab a FREEBIE! Photography Concentrate's Black Friday event is now on! 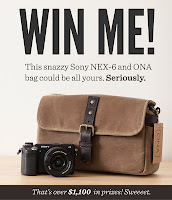 Enter to win a Sony NEX-6 and ONA bag, save 40% off all tutorials, and grab their newest freebie! All of their tutorials are 40% off, WOO!!!! If you're looking to sharpen up your photography skills, now is the time. All tutorials are digital downloads that you can dig into right away. You could be on your way to better photography today! For more details on each tutorial, take a stroll through the shop! P.S. The discount is already applied in your cart — no need to mess around with coupons. It's super easy to get this deal! A great questionnaire can help you create better photos. True! Not only do you get to know your clients, and get excited about photographing them, but you also learn important details that help you capture who they are in your images. We've seen first hand what a huge difference a great questionnaire can make in our own portrait business. So we're giving you our questionnaires, totally free! Included are questionnaires for a couple, family, newborn and individual session. Each one comes as a PDF that you can print or email, and an InDesign file that you can customize.